Applications for volunteering at the Music Festival have now closed. Check back here in March 2020 for information on volunteering at the 2020 Music Festival. Cheltenham Music Festival is looking for friendly, hard-working and enthusiastic volunteers. Volunteers will be needed from Thursday 4 July – Monday 15 July to help with all aspects of running a successful festival. This would be a valuable experience especially for those passionate about arts administration, events management and music management. In return for volunteers’ hard work, UK travel expenses are paid and accommodation is provided if not local (in shared apartments), as is a small contribution towards living costs. You will also receive a free Cheltenham Festivals T-shirt to wear during the festival and to keep. And of course, the opportunity to get behind the scenes at a famous festival with the chance to see great events for free! Preparing the stage for performance – laying out chairs for an orchestra, moving pianos, or setting up for talks. Volunteers are asked to commit to full time for the duration of the Festival. Working hours during the festival are long and tiring. Days can start at 8am and don’t finish until the last event has finished, sometimes as late as 11pm. We are looking for highly motivated and reliable volunteers who will be happy to do whatever task is required of them. Volunteers will need to have good teamwork skills, initiative, and the stamina to work long hours. Evidence for a passion for music, experience with ensembles and/or skills in events management would be a plus. 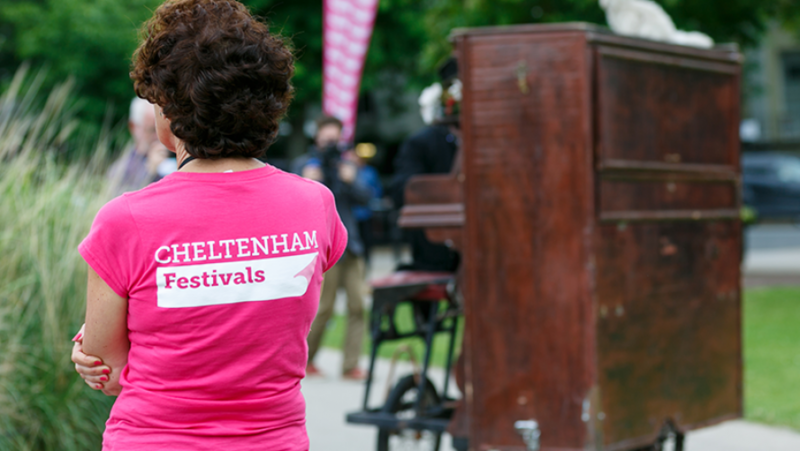 Being a ‘runner’ at Cheltenham Music Festival is a good place to start for anyone considering a career in arts administration or events management—and it’s a great thing to have on your CV. Past volunteers have gone on to work in all sectors of the arts, including classical music agencies, Wigmore Hall, the BBC Proms and the London Philharmonic Orchestra.